Burritos are one of the most satisfying meals one can eat. The problem is that I live in Saudi Arabia and it's hard to find good tortillas that are not loaded with preservatives. So the other alternative is a burrito bowl with lots of rice! 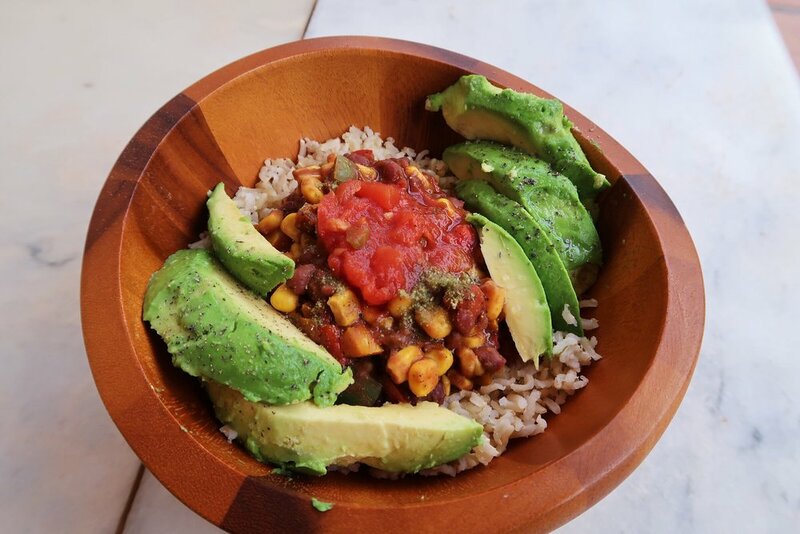 In my opinion, bowls are even more satisfying, as we tend to eat them slower and more mindfully. This recipe is very easy and quick to make. I made it before going to work and had it for breakfast and dinner! If you think it's weird to eat a burrito bowl for breakfast, then I want you to know that many people in Sout American eat beans and rice for breakfast. Even here in the Middle East, it's common to eat fava beans and hummus for breakfast. Eat it warm or store it in a jar and eat it later. Anddd if you place the avocados on top and squeeze some lemon juice on them, they'll stay fresh until you eat them for dinner or lunch! Another tip if you're going to eat half of an avocado, then store the other half in the freezer and use it later in smoothies or soups to make them extra creamy!! Serve with rice and top with avocado and salsa. *If you're using canned beans that are stored in salt and water then use the whole can. If not, then wash and rinse the beans and add a little bit of water to the saucepan.